5km: male and female all ages over 8, but children under 11 must be within arm’s reach of a parent, guardian or designated adult of the parent’s choice running the course at the same time. ENTRIES ARE AVAILABLE ON THE DAY, FROM 8.30AM. REGISTRATIONS WILL CLOSE AT 10.30AM. The Checkendon Run is set within countryside north of the village of Checkendon, Oxfordshire. 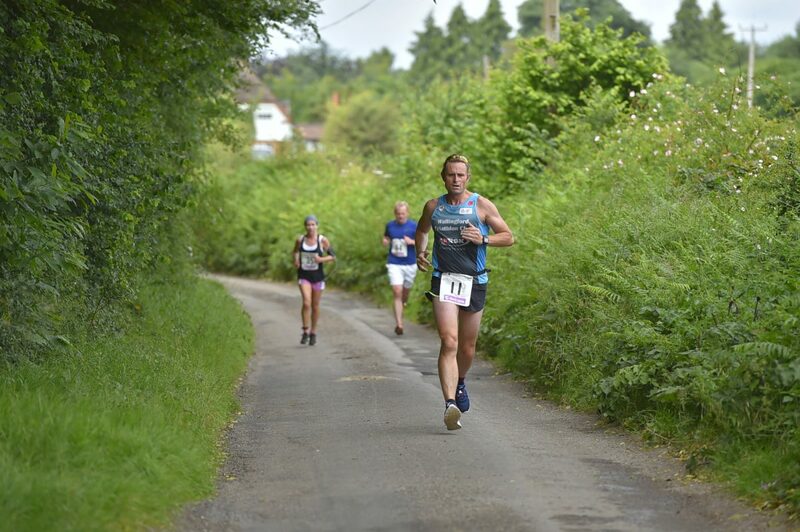 The course is multi-terrain and includes a mixture of quiet roads, farm tracks and footpaths. Starting in a beautiful pasture field it descends within the Chilterns, climbing back to the village via an off-road route. The children’s course is set within the pasture field. There will be a variety of distances available – entries on the day. The car park and start can be found at Hammonds Farm, Checkendon, RG8 0SR. There will be signs and feather flags marking the entrance to the field. Directions from Reading: Take the right turn signposted Checkendon from the A4074, go past the turning to Exlade Street on the right hand side, past left turn to Hammonds Farm, and take next field gate entrance adjacent to the dead oak tree. Directions from Oxford: Take the left turn signposted Checkendon from the A4074, go past the turning to Exlade Street on the right hand side, past left turn to Hammonds Farm, and take next field gate entrance adjacent to the dead oak tree. Directions from Henley: Come through Stoke Row and take the left turn into Uxmore Road. Continue through the village and out the other side. You will see the field gate on your right hand side adjacent to the dead oak tree. Children’s races: You may run in an event above your age group (i.e. a 7 year old can run in the 11 and under 1600m race) but you may not run in an event under your age group. 5km: You must be 9 years old or over to run the 5km. Children under 11 must be within arm’s reach of a parent, guardian or designated adult of the parent’s choice running the course at the same time . Under 16s must have a parent, guardian or designated adult of the parent’s choice waiting in the start / finish area. 10km: You must be 16 or over to run the 10km route. All entries for the Children’s Races will be taken on the day. Please look for the registration desk marked ‘Children’s Races’. Entry costs £5 per child. If you have other friends and family who have not yet entered but want to join in this amazing event, then entries will also be available on the day for the 5km and 10km, subject to availability. We will make an announcement on the website and on Facebook if the event has sold out in advance. Please collect your race number and timing chip from the Registration desk. Please go to the counter marked ‘Number & Chip collection’. Your timing chip must be affixed using the Velcro ankle strap. Please ensure you return your chip at the end of the race in the buckets by the finish line. We regret there are no changing facilities available in the field but there will of course be portaloos available for the obligatory pre-run nervous wee! There will be a bag drop available in the registration tent. However belongings are left at your own risk. It is vital that you attend the race briefing for your event. We advise that you do not wear earphones as the race is run on open roads. You therefore need to be able to hear marshals, traffic and probably horses knowing Checkendon! There will be 2 water stations on the 10km (at c.4km and 8km) route and 1 on the 5km route (at c.3km). There will also be water available at the finish line. There will be entertainment for children in the start / finish area including a bouncy castle and face painting so bring lots of change with you. We will also be running a raffle with some amazing prizes. Hot food and drinks will be available from our award winning local farm shop Blue Tin and there will be a cake stall so you can replace all those calories you burn out on the course. Photographs will be taken on the day by our excellent local photographer, Charlotte Snowden, and will be available to purchase after the event. There will be a First Aid point in the Race HQ tent, marked with a feather flag. If you require medical assistance at any point during the event please alert and organizer or marshal. The emergency mobile contact number on the day is 07772 328422. We advise that you do not run, if you are unwell, have an injury or are not comfortable running at least 8km (for 10km runners) and 4km (for 5km runners). The cut off for the 10km is 90 minutes and the cut off for the 5km is 75 minutes. Marshals will be removed from the course for their own safety at 12.30pm. If you are still on the course at this time then the safety vehicle will make you aware that the marshals are no longer deployed and that if you choose to continue you do so at your own risk. Race results will be available at the finish. They will also be online via a link on the Results tab of this website, where you will be able to download your finisher’s certificate after the race. There will be medals for finishers of all races. There will certificates for the 1st, 2nd and 3rd place boys and girls in each category of children’s races. There will be trophies for the male and female winners of the 5km and 10km. Runners are advised to allow plenty of time to warm up. Runners are required to write details of any medical conditions on the reverse of their race number. You will have told us about any pre-existing medical conditions when you registered and asked to confirm that to their knowledge they are medically fit to take part, but if you have any new conditions please let us know. * Please ensure that you are wearing appropriate footwear. * Runners should walk if coming across a hazard and inform other runners of the hazard. * During wet weather and as a result in the build-up of mud, ground conditions may deteriorate and become slippery. The event stewards and safety officer shall monitor the ground conditions and make a dynamic assessment of the need for further controls/cancellation of the event as appropriate. * All persons are advised to wear clothing appropriate to weather conditions. * Any persons coming into contact with any wild or domestic animals should walk calmly passed the animal and make no attempt to interact with the animal in any way. Remember animals, especially wild animals can become startled and behave in an unpredictable manner. Condition of the course and race cancellation: In the extreme event that the wet weather route is also considered by the race committee to be unsafe or flooded then we reserve the right to cancel the race at up to 24-hours from the race start time. Should this occur notification will be sent by email to your race entry email address. We regret that we cannot offer refunds if the race is cancelled due to extreme conditions as we will have already incurred all our running costs. As we organise the race to support the local preschool we ask for your understanding and support. If you have any queries about the day please email enquiries@checkendon-run.org.uk. We are looking forward to seeing you all ready and raring to go!